The skin which surrounds the hands provides a protective barrier, which can easily change when continuously exposed to external elements (cold, dryness, wind…). Because of this hand care is fundamental to avoid the loss of the natural dynamic equilibrium of the epidermis. The Aloe Vera plant is rich in vitamins, minerals, proteins, oligo-elements and amino acids which help to re-establish the dynamic equilibrium of the skin, helping it to recover its qualities as a protective barrier. This hand cream is enriched with pure ALOE VERA cultivated on our own plantation, where is it obtained naturally and ecologically. In this way it preserves all of the properties which help to protect and regenerate dry and chapped hands, deeply moisturising while at the same time alleviating irritation, broken skin and other problems. For daily use, apply as often as necessary to hands and nails. Also recommended for use on heels, knees and elbows. 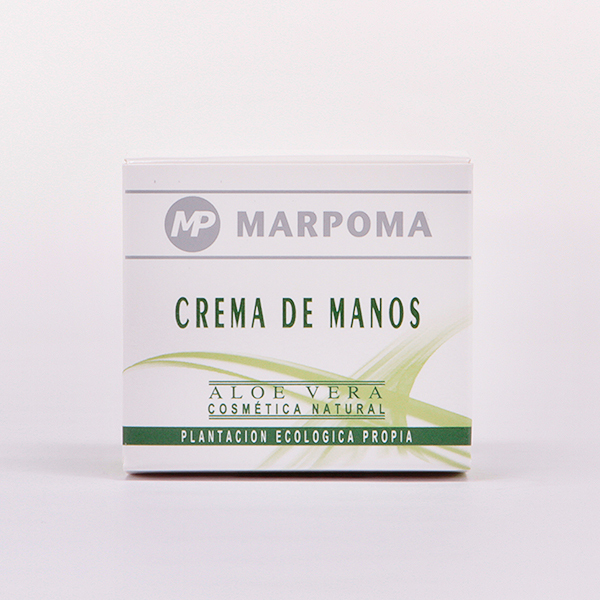 The same cream is available containing different percentages of pure ecological Aloe Vera in its formula. Presentation: 50, 60 and 200 ml container. For larger quantities consult the factory. If you are interested in Marpoma | Natural Cosmetics, do not wait and contact now!